FLA President Auret van Heerden said after his first visits to Foxconn's facilities this week that the operation is "first class," adding that conditions are "way, way above the average of the norm," according to Reuters. Van Heerden spent the last two days visiting the facilities as part of an independent audit requested by Apple. In fact, van Heerden even suggested that "boredom and alienation" could have been the main contributors to stress that led to a string of suicides at the company's plants years ago. Because the audits have just gotten underway, van Heerden and the FLA have not issued any conclusions on the working conditions at Foxconn. "I was very surprised when I walked onto the floor at Foxconn, how tranquil it is compared with a garment factory," the FLA president said. "So the problems are not the intensity and burnout and pressure-cooker environment you have in a garment factory. It's more a function of monotony, of boredom, of alienation perhaps." Van Heerden said on Wednesday that Apple did not need to joint he FLA, and the company could have taken easier options if it wanted. He said the fact that Apple joined the association shows the company is "really serious about raising their game." "The FLA system is very tough," he said. "It involves unannounced visits, complete access, public reporting." The FLA audits come soon after a firestorm of media scrutiny surrounding Foxconn and Apple's continued partnership with the company. Recent reports from The New York Times and CNN highlighted potential labor issues in Apple's supply chain, with claims of forced overtime and low wages. One woman interviewed by CNN said she had never even seen an iPad in person, even though she assembles them for a living. And the Times story included comments from anonymous current or former Apple executives, who suggested Apple has ignored labor issues because the current methods are favorable to the company. The Times report incensed Apple Chief Executive Tim Cook, who issued an e-mail to employees declaring the anonymous criticisms "patently false and offensive." He promised that Apple will never "stand still or turn a blind eye to problems in our supply chain." 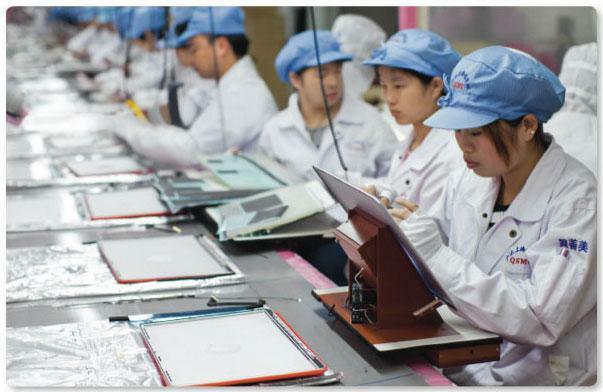 After Foxconn, the FLA plans to move on to two other Apple suppliers, Pegatron and Quanta, to audit their facilities. Pegatron said this week that the upcoming inspections have not been announced to them.